If you are looking for a nostalgic, old-fashioned candy store or want to sample sweet, homemade treats, Scoops proudly offers something for everyone. 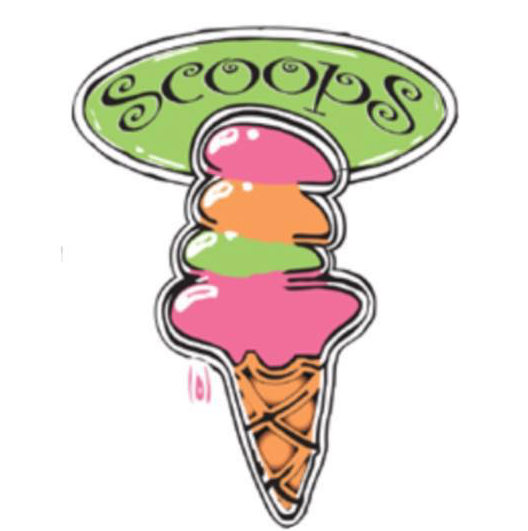 "A visit to Scoops is a sweet experience for all ages," said Founder Susan Kirk. "It's more than just a candy shop – it's an adventure for the senses with the scent of luscious chocolates and fresh-roasted coffee filling the air, the sight of homemade Chocolates and apples being hand-dipped on-site, and the experience of walking into this vibrant, lively. modern rendition of the old-fashioned candy store showcasing a variety of salted, bubbly, sticky, and sweet treats. store complete with welcoming you inside." We proudly craft our confections in the uncompromising way of a bygone era – by hand in small batches with fresh ingredients and the finest chocolates, right in our shops. All of our handmade artisan chocolate bars, truffles, caramels, frogs and other confections use a unique blend of flavors and ingredients to create rich, delicious indulgences unlike any other. Treat yourself, or your friends and family, with our award-winning handmade artisan chocolate confections. Nothing embodies the joy of a sweet treats better than our gourmet apples. We believe that crafting high-end, palate-pleasing caramel apples means using the best ingredients and pouring love into every apple we dip. They all start with a crisp, green Granny Smith apple smothered with thick and chewy handmade caramel then top them with amazing toppings! Scoops is the perfect stop for the kid in all of us. With hundreds of varieties of candy from many past decades right up to the present, there's something here to make just about anyone nostalgic. When people first see our selection they often feel like they are taking a walk down candy memory lane. Our Delicious cookies turn the simplest of moments into something memorable. Your favorite soda topped with one or two scoops of rich and creamy ice cream of you choice. If that’s not enough, we’ve added a cloud of whipped cream and a cherry. A sweet treat to remember. Called "Old Fashioned" because we make them that way. We take syrup and blend it with a little of our ice cream to make a thick and creamy base. Then, we jet in the soda and add one or two delicious scoops of the ice cream of your choice. We top it off with a cloud of whipped cream and a maraschino cherry. Sodalicious! The richest and creamiest shakes around. We start with a huge portion of ice cream (two scoops), add fresh whole milk, and your favorite flavoring to give you the richest and creamiest shake you'll ever taste. Or choose your favorite flavor of ice cream and make your own special mix. If you like your shakes extra thick, just add an extra scoop of ice cream. Looking for a delicious gift? Browse our collection of candy gift baskets. Overflowing with sweet treats, they're perfectly delicious for any occasion! Shop delicious candies for your loved ones, friends, teachers and more. Find the perfect candy arrangement to celebrate today's special occasion.